If you don’t want to spend $1000 on a quilting machine (like the Juki tl2010 reviewed here), then at this price range, this model is one of the best rated quilting machines we’ve ever seen, it’s hard to find anything to complain about with this machine. When it comes to quilting machines, it’s hard to beat the Brother PQ1500SL – unless you have a $1,000+ budget. The great thing about this machine is that it can be used for both quilting and everyday sewing projects, although you’re limited in stitch selection. 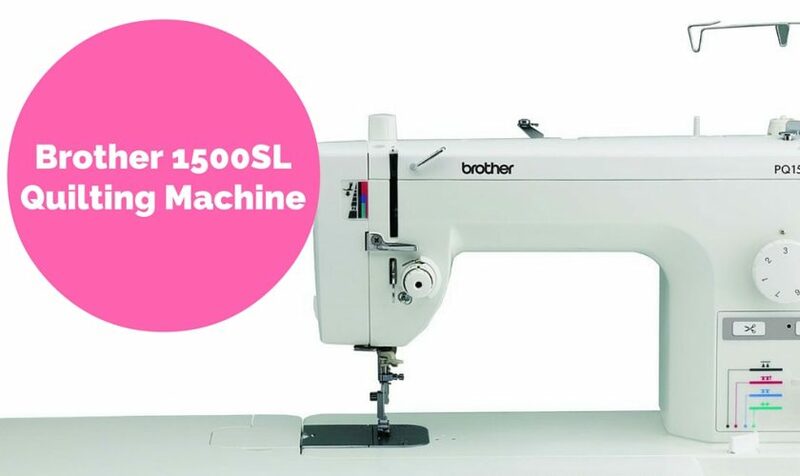 With a maximum sewing speed of 1,500 stitches per minute, the PQ1500SL is lightning fast. But just like a regular sewing machine, this model uses a foot pedal to control the sewing speed. Move as quickly or as slowly as you like. The fast sewing speed allows you to finish projects quickly, or move slowly to ensure that intricate designs are carried out properly. The PQ1500SL makes machine quilting more convenient by offering an automatic needle threader, thread trimmers and needle positioner. All of these features work to save you time, which is better spent sewing the quilt – not preparing the machine. A valuable feature for any quilter. The built-in knee lever allows for hands-free lifting and lowering of the pressor foot, so you can focus on re-positioning or removing your fabric. The built-in knee lever is an excellent feature, but so is the included extension table, which spans 12” x 18”. The large table adds valuable working space, which makes it easier to complete your projects without having to constantly re-position the fabric. If you enjoy free motion quilting, you’ll love the feed dog height adjustment feature. Four heights are available to accommodate just about any project. A pin feed mechanism is also included, which allows you to exchange the feed dogs for a pin, which cleanly extends from underneath the machine. This pin allows you to move your quilt layers together with ease, or to work with difficult fabrics, like velvet, without leaving feed dog marks behind. With the touch of a dial, you can quickly and easily adjust this Brother quilting machine’s tension level. We did notice some users complain about tension issues, and this is likely because they did not thread either the machine or the bobbin correctly. If the machine is properly threaded, the adjustment dial should fix the tension issue. All of these accessories make it easy to complete your quilting and sewing projects right out of the box. If you enjoy machine quilting, the PQ1500SL offers numerous benefit – whether you’re a beginner or experienced professional. With the push of a button, you can automatically adjust the needle’s position. The automatic threading feature also saves you time, so you can complete projects quickly and easily. We also like that the bobbin casing is on the side of the machine rather than on the top or front. The location and height of the casing makes it easy to switch out bobbins while you’re sewing with minimal interruption. If you’re a heavy or frequent user, you’ll need to oil the PQ1500SL often. But unlike other sewing machines, which force you to take apart the machine for oiling, the PQ1500SL has small oil holes on the outside of the machine. These holes make it easy to oil the machine without having to take apart the entire unit. A cleaning brush is included, too, so you can keep your machine clean and running in tip top shape. The included extension table extends 12” x 18,” so you have plenty of room for quilting. The table is sturdy, too, so you never have to worry about it wobbling and interfering with your sewing. The throat is large at around 9,” which is more than enough space to allow you to continue quilting without having to constantly re-position the fabric. Although the PQ1500SL is capable sewing up to 1,500 stitches per minute, its motor is quiet. You won’t wake the entire house or your sewing table when sewing or quilting, which is a bonus for both you and your family. The thread cutter does trim the thread a little short – to the point where it unthreads the needle. When this happens, simply continue sewing and the machine will pull up the bobbin thread for you. Click here to learn more about the Brother PQ1500SL quilting machine. 9.6 tech score This is an outstanding machine at this mid-level price range. It is powerful, reliable and easy to use. Best of all it performs like higher priced quilting machines we've used. Where is the Brother 1500 made? Does it have any decorative stitches? It has zipper and rolled hem feet but otherwise looks like quilting only; no clothes or design stitches. Does the Brother PQ-1500S High Speed Straight Stitch Sewing Machine have a stitch reglator for when you are doing free motion quilting? Is it a low shank? Snap on feet? Yes. Low shank snap on feet like other Brother machines. Bobbin is metal specific to this Brother. Love it. No, this is a high shank machine, but there are aftermarket adapters that can be purchased that enable it to use the snap on feet. I have had mine for over 5 years and I love it still.